Gezi is this land’s hope for equality, freedom and justice. The Gezi Resistance is one of the brightest and most honourable pages in our country’s social, urban or democratic history, and its legitimacy on a constitutional basis has been placed on record with previous court rulings. Now, with an unlawful and untruthful bill of indictment, an attempt is being made to smear the Gezi Resistance, to depict its basic demands for rights as elements of crime, to distort the historical and legitimate truth of peaceful resistance, and once more, to put Gezi on trial. An irrational bill of indictment, inspired entirely by conspiracy theories and with no basis in factual evidence has been prepared by the Istanbul Chief Public Prosecutor’s Office, and was accepted in the past week by the Istanbul 30th Heavy Penal Court: This is an attempt to rewrite the history of Gezi. We reject your futile efforts to smear Gezi! It was we who lived Gezi, and we know this well: Gezi is this land’s hope for equality, freedom and justice. So let us repeat: Gezi constitutes one of the most brilliant and most honourable pages in our country’s social history. In contrast to your desperate claims, it had neither an internal or external chief, leader, instructor, top organization or bankroller! It was the absence of all such things that made Gezi what it is. We will not allow you to recast the Gezi Resistance as an action associated with crime, terror, coups or insurrections. Society and public opinion have paid no heed to such impositions on perception that have continued systematically since June 2013. Besides, the fact that the Gezi Resistance took place on a perfectly legitimate and constitutional basis and within the framework of democratic rights and freedom of expression has been placed on record with previous court rulings. Despite all these clear facts, 16 people are being tried – facing aggravated life imprisonment and a series of additional sentences -, forming the final example showing that the judiciary in our country has become a mere agency charged with serving the government’s survival. Academics who have demanded peace are being tried and sentenced for carrying out propaganda of a terror organization; lawyers who perform their professional and constitutional duty are being jailed under unimaginable accusations to silence them; journalist seeking the truth are declared terrorists under baseless accusations and no evidence, and we know very well why: This government is an enemy of critical views and voices, and is aware of the deep disquiet its failing policies have created across society. It is precisely for this reason that those who should actually be held accountable for what happened during the Gezi Resistance are listed as Claimants and Complainants in this bill of indictment. Those who ordered the extraordinary police violence that led to the death of tens of our friends, tens of our friends losing their eyes, and thousands of them being injured; and also those who protected the forces that implemented this violence should be the real defendants in the Gezi case. Those who, rather than lending an ear to the rightful and legitimate demands of citizens expressed in all corners of the country at peaceful actions; chose to use the state’s judiciary to suppress democratic demands and to create an enemy out of a certain section of society should be the real defendants in the Gezi case. Below is our own assessment of this bill of indictment, which completely reverses universal legal norms, does not even respect the most basic legal norms, and in the absence of concrete evidence, uses a set of expressions like “it has been understood that”, “it has been assessed that”, and “it has been evaluated that” to make its claims. “It has been understood that” those who have counted, down to the last splinter, the number of broken car windshields, have overlooked the lives we lost due to disproportionate police violence. “It has been understood that” the number of damaged rubbish containers have been thoroughly recorded, yet our tens of friends who lost their eyes because of tear gas canisters directly targeted at them have been overlooked. “It has been understood” from the manner in which the authors of this bill of indictment have listed, page after page, tapped telephone conversation transcripts that form the basis to nothing other than the revelation of private lives, that their aim is to serve certain unlawful purposes. “It has been understood that” the authors of this bill of indictment aim not only to smear the past, but also to cast a shadow on our shared future. The saddest aspect of it all is that, this entirely baseless bill of indictment, which makes a mockery of justice with its completely imagined accusations, will once again ruin the reputation of a judiciary that has already lost its credibility in the eyes of society. This bill of indictment, which extracts, from a bee-culture-map, ‘a plan to divide the country’; perceives the purchase of pastries and sandwiches for people in the park as ‘bankrolling the resistance’; creates ‘external powers’ from tourists visiting Antalya for holidays; and interprets the act of giving flowers to police officers on duty at Gezi Park as ‘an attempt to overthrow the government’, could have been described as comical, if it had not taken hostage the freedom of the people it targets as suspects, and threatened them with aggravated life imprisonment. However, it is a historical responsibility to provide all these accusations with the most serious response. Let us not forget that, in this court case, in the image of 16 people, it is in fact millions of citizens who are being placed on trial: The millions who took part in Gezi in 80 cities across our country, and strengthened democracy by using their constitutional rights. So, against those who have come up with all types of irrational news reports, slander and defamation in that world of lies they created to support the government, we invite every single one of our citizens to read the 657-page-bill-of-indictment in full. The Istanbul 30th Heavy Penal Court accepted this bill of indictment on 4 March 2019, and declared 24-25 June 2019 as the date for the first hearing. This irrational and unlawful bill of indictment must immediately be withdrawn, and Mehmet Osman Kavala and Yiğit Aksakoğlu, who have been held pending trial on the basis of these fictionalized accusations, must be released immediately. We, Taksim Solidarity, will continue to resolutely stand behind our demands set during our first meeting held in February 2012, our reaction displayed when the trees were cut down and our tents were burned down in Gezi Park, our stance calling to account the police violence that took the lives of our young friends, and the demands for freedom, democracy and a humane life of millions of people who took to parks, squares and streets during the resistance. In the face of those who seek to suppress the truth and to distort history using the police, judiciary and the media, we will continue to shout out the facts. We know that if democracy is to come to this country one day, it will draw power from Gezi’s egalitarian, libertarian and peaceful togetherness. You may put millions of people on trial, but you will never destroy the truth. We will never allow you to recast the Gezi Resistance as an action associated with crime, terror, coups or insurrections. 4 yıl önce bugünlerde Taksim Meydanı ve Gezi Parkı başta olmak üzere, yaşam alanlarımıza amansız ve hukuksuz bir şiddetle saldıranların karşısında omuz omuza verdik. Gençlerimizin yaratıcı zekâsıyla, annelerimizin kucaklayan şefkatiyle, işçi kardeşlerimizin emekten gelen gücüyle, kadınlarımızın gür sesiyle, LGBTİ bireylerimizin biz de varız çığlığıyla el ele verip dayanışmamızı ve direnişimizi büyüttük. Bu onurlu direniş ve evrensel dayanışma karşısında çaresizlerin ve korkakların günden güne daha da kirlenen politikalarına, günden güne tırmandırılan şiddetine, adaletsizliğine karşı biz Gezi’nin çapulcuları onlarca ayrı dille, sesle, renkle bir arada durduk, nefes aldık. Dünyaya örnek olan, umut veren; muktedirlerin ise bir hayalet gibi korktukları, dillerinden düşürmedikleri Gezi direnişimiz 4 yaşında. Korkmakta haklılar, gördüler ki; biz bir araya geldiğimizde biz birbirimizi çok seviyoruz. Gördüler ki; biz bir araya geldiğimizde karanlığa dur diyebiliyoruz. Gördüler ki; plastik mermiler, biber gazları, gözaltılar, tutuklamalar bizi korkutamıyor. Gördüler ki; biz parkımız, geleceğimiz, çocuklarımız, ailelerimiz için tüm renklerimizle direniyoruz. Gördüler ki; biz bir araya geldiğimizde düşlediğimiz hayatı kuruyoruz. ve gördüler ki, Gezi’den bugüne 4 yıldır biz karanlığa, şiddete, haksızlığa HAYIR demeye devam ediyoruz. 4 yıldır her geçen gün etrafımızı daha fazla saran karanlığın farkındayız. Ne Anayasa’nın ne uluslararası sözleşmelerin, ne de AİHM kriterlerinin dikkate alındığı, hukuksuzluk ve keyfiliğin kutsandığı bir siyasal iklimde yaşıyoruz. Bu keyfiliği biz GEZİ sürecinden iyi tanıyoruz. İktidar sahiplerinden güç alan, hukuk ve kural tanımaz polis şiddetinin yaşamlarımızı nasıl kararttığını unutmuş değiliz. Onlarca arkadaşımızın gözlerini kaybetmesinin, binlercesinin yaralanmasının, bunun ardından faillerin ve azmettiricilerin cezasız bırakılmasının böylesi bir kural tanımazlıktan beslendiğine şahit olanlarız. Ethem Sarısülük ile Medeni Yıldırım’ı öldüren polis ve jandarma kurşunlarının, Ali İsmail’e yönelen ölümcül tekmelerin sahiplerinin, Abdullah Cömert’i, Ahmet Atakan’ı, Berkin Elvan’ı yaşamdan koparan biber gazı fişeklerinin, Hasan Ferit’i vuran mafya bozuntularının ve Mehmet Ayvalıtaş’ı bizden alan pervasızlığın bu hukuksuzluktan güç aldığını bilenleriz. Özgürlükten, demokrasiden, barıştan ve doğadan olan herkesin açlıkla, ölümle ve hapisle sınandığını, hırsızlığın, yolsuzluğun, katliamların, taciz ve tecavüzlerin cezasızlıkla ödüllendirildiğini; bir insanı katletmenin bedelinin mahkeme masraflarından daha az olduğunu; 80 gündür çocuğunun kemiklerini alabilmek için açlık grevi yapan babaya oğlunun kemiklerinin kargoyla gönderildiğini görenleriz. Herkesin susmasını, herkesin biat etmesini, herkesin el pençe divan durmasını isteyenlerin haklarını talep edenler karşısında hukuksuzluğa, adaletsizliğe, vicdansızlığa nasıl sarıldıklarını; parlamentonun işlevsizleştirilmesi için milletvekillerinin tutuklanmasına, şiddete nasıl ihtiyaç duyduklarını yaşayarak öğrenenleriz. Baştan sona adaletsiz ve eşitsiz bir ortamda gerçekleştirilen Anayasa referandumunun bile nasıl oy hırsızlığı ile maniple edildiğini hep birlikte yaşadık. Demokrasi isteyenlerin oylarının nasıl gasp edilmeye çalışıldığını hep birlikte gördük. Gezi’de barıştan, özgürlükten, doğadan eşitlik ve dayanışmadan yana kurduğumuz hayatın peşinde olanların KHK’larla, ihraçlarla, açlıkla, tutuklamalarla sınandığı bu karanlıkta, dayanışmamızdan ve birbirimizden vazgeçmiyoruz. OHAL adı altında yerleştirilen bu karanlığa, haksızlığa, talana, şiddete, cezasızlığa Gezi’den aldığımız güç ve kazanımlar ışığında hayır diyoruz. Bilinsin ki; Gezi direnişi bu toplumun tarihinde bir onur sayfası olarak yerini almıştır. Dünyaya örnek olan Gezi direnişi, en temel hak taleplerinin hukuksuzca cezalandırılmaya çalışıldığı davalarda suç unsuru olarak gösterilip kriminalize edilmeye çalışılmaktadır. Bunu reddediyor, kendi hukuksuz ve onursuzluklarının yarattığı korku ve kâbusları nedeniyle bu sayfanın karalanmasına izin vermiyoruz. 4 yıl önce bir parkta birlikteliğimizden yarattığımız gücümüzle tekrarlıyoruz; Başta Taksim Meydanı ve Gezi Parkı olmak üzere yaşam alanlarımızın, ormanlarımızın, parklarımızın, meydanlarımızın, kentlerimizin, insan hakları anıtımızın dahi abluka altına alınmasını ve yok edilmesini, ülkemizin bir cezaevine dönüştürülmesini hiçbir zaman kabul etmiyoruz, kabul etmeyeceğiz. Hayır Bitmedi, Mücadeleye devam diyoruz! 27 Mayıs 2017 saat 20: 00 İstiklal Caddesi’nde Yeryüzü Sofrası’nda buluşuyoruz. 31 Mayıs 2017, saat 19: 30’da Taksimden Gezi Parkımıza gidiyoruz! 15 Şubat 2012 tarihinde Taksim Meydanı ve Taksim Gezi Parkı’nı geri dönüşü olmayacak bir biçimde yok edecek projelere karşı hukuksal ve toplumsal alanda mücadele etmek üzere Taksim Dayanışması adı altında bir araya geldik. Dayanışmamız ve verdiğimiz mücadele, etik, bilim, teknik ve hukuk tanımaz iktidarın ısrarlı çabalarının, 27 Mayıs 2013 tarihinde amansız ve hukuksuz bir şiddete dönüşmesi ile birlikte 31 Mayıs 2013 tarihinden itibaren ülkenin dört bir yerine yayılarak dünya toplum, kent ve demokrasi tarihinde izi silinemez yepyeni ve evrensel bir boyut kazanmıştır. Demokrasiden, hukuktan, adaletten, insanlıktan, barıştan ve doğadan yana her türlü sesin giderek artan bir baskı ve şiddetle kısılmaya çalışıldığı bu günlerde ise Dayanışmamızın ve onurlu direnişimizin haklılığı her gün bir kez daha kanıtlanmaktadır. Taksim Dayanışması olarak 31 Mayıs 2013’ten bu güne yaşadığımız süreci değerlendirmek, gelişmeleri paylaşmak ve Direnişimizin dördüncü yılında etkinlik programını açıklamak üzere 25 Mayıs 2017 Perşembe günü saat 11.00’da TMMOB Mimarlar Odası İstanbul Şubesi Karaköy Binası’nda gerçekleştireceğimiz basın toplantısına tüm basın mensuplarını ve duyarlı halkımızı davet ediyoruz. Tüm yurttaşları 6 Nisan 2017′de davayı, davamızı sahiplenmeye çağırıyoruz. Berkin’imizin vuruluşunun 4, uğurlayışımızın 3 üncü yılındayız. Milyonlar olup uğurladığımız; bir halkın yalnızca toprağına ve yüreğine değil aynı zamanda azmine ve umuduna emanet ettiğimiz Berkin’imizin katledilmesinin hesabını sormak için önemli bir tarihin arifesindeyiz. Türkiye karanlık günlerden geçiyor. İşte bu yüzden, Berkin’in katillerinden hesap sorma mücadelemiz dünümüz için değil geleceğimiz içindir. Berkin’in haince katledilmesinin hesabını sormak sadece canımız oğlumuzun anısına sahip çıkmak için değildir. Emri ben verdim diyen başta olmak üzere en alttakinden en üsttekine, tüm katillerden hesap sorma mücadelemiz, tüm bu zifiri karanlıktan çıkış için önemlidir. Tetiği çekenden de emri verenden de hesap sormak için 6 Nisan 2017′de Çağlayan’da olacağız. Bu ülkeyi ve bizleri ölümlere, katliamlara alıştırmaya çalışanlar çok iyi bilsin ki, alışmayacağız! Gözümüzün önünde işlenen cinayetlere sessiz kalmayacak, faillerinin cezasız bırakılmasını kabullenmeyeceğiz! 14 yaşında evinin sokağında biber gazı fişeği ile öldürülen Berkin Elvan’ın bütün katilleri ve azmettiricileri yargılanmadan ve hak ettikleri cezalara çarptırılmadan rahat bir uyku uyumayacağız! Umudumuzun çocuğu Berkin Elvan, dünyaya örnek olan bir dayanışmayla daha yaşanılabilir bir kent, daha fazla özgürlük ve demokrasi taleplerimizin İstanbul’un dört yanına ve ülkenin her iline yayıldığı bir dönemde 16 Haziran 2013 te Okmeydanı’ndaki evinin yakınında hedef gözetilerek atılan biber gazı fişeğinin doğrudan kafasına isabet etmesi sonucu yaralandı. Ağır yaralı olarak hastanede hayata tutunmaya çalıştığı tam 259 gün boyunca milyonlarca insan onunla birlikte ülkede özgürlük ve demokrasinin “ iyileşmesini – hayat bulmasını” bekledi. Ne yazık ki Berkinimiz 11 Mart 2014 günü yaşamını yitirdi. O günden bu yana ülkemizin üstüne çöken karabasanın yarattığı zifiri karanlık her yeri ve her şeyi çürüterek derinleşmesini sürdürdü. Gencecik bedenlerin ölümü üzerinden sürdürülen iktidar oyunları, Abdullah Cömert’in, Ali İsmail’in, Ethem Sarısülük’ün, Medeni Yıldırım’ın, Hasan Ferit Gedik’in, Mehmet Ayvalıtaş’ın ve Ahmet Atakan’ın ölümünü yeterli görmedi. Hastanede hayata tutunmaya çalışan Berkin’i de katilleri yargılanmayanlar, hatta korunanlar arasına kattı. Berkin’in cenazesinde meydanlara sığmayan milyonlar, okul bahçelerinden yankılanan marşlar tesadüf değildi. Berkin’in sıkılan ölümcül fişeğin, Gezi direnişi boyunca ülkenin her yanında haykırılan demokrasi ve özgürlük talebine sıkılmış olduğunun herkes farkında… Berkin’in bütün “katillerinin ve azmettiricilerinin” yargılanmasını ve cezalandırılmasını istemek sadece Berkin için değil, bu ülkede yaşayan ve yaşayacak olan herkes için adalet, hukuk, demokrasi ve özgürlük talebidir. Taksim Dayanışması olarak; 2012 Şubatında ilk toplantımızı yaptığımız andaki taleplerimizin de, Gezi parkındaki ağaçların kesildiği, çadırlarımızın yakıldığı günlerdeki tepkimizin de, gencecik çocuklarımıza kıyan polis şiddetinden hesap soran tutumumuzun da, parklarda, meydanlarda, sokaklarda özgürlük, demokrasi ve insanca yaşam talep eden milyonların taleplerinin de kararlılıkla arkasındayız. Bugün 14 yaşında bir çocuğun başından vurularak katledildiği 6 Nisan 2017 günü gerçekleşecek olan Berkin Elvan’ın öldürülmesi davasının ilk duruşmasına çağrı yaptığımız bu basın toplantısı ile ilk günden bugüne söylediğimiz ve dillendirmeye devam edeceğimiz taleplerimizi bir kez daha kamuoyu ile paylaşmak istiyoruz. Her gün bir başka gencin ölüm haberini alıyor olmamız bizlerin o kanlı dünyayı kabullenmemize yol açmayacak. Ölüme karşı yaşamı savunmaya inatla ve ısrarla devam edeceğiz. Berkin’in o kısacık ömründen bizlere yansıttığı gelecek umuduna sadık kalacak, yeni Berkin’ler öldürülmesin diye katillerinin yargılanması ve hak ettikleri cezalara çarptırılması talebindeki ısrarımızı sürdüreceğiz. Biliyoruz ve inanıyoruz ki, katilleri yargılanıp azmettiricileri ile birlikte hak ettikleri cezalara çarptırıldığı zaman adları Berkin konmuş çocukların oynadığı tüm parklarda ve ülkemizin dört bir yanında Elvan Elvan çiçekler açacak! Berkin Elvan’ı Mezarı Başında Anıyoruz! Umudun çocuğu Berkin’imizi yitireli tam 3 yıl oldu! Berkin Elvan’ın Ailesi ve Taksim Dayanışması olarak 11 Mart Cumartesi günü saat 14.00′da Feriköy Mezarlığında gerçekleştirilecek anma etkinliğine tüm dayanışma bileşenlerini bekliyoruz. Saat 16.00′da ise mahallede Berkinimizin anısına lokma dağıtılacaktır. Tüm bileşenlerimizin anma duyurusunun yaygınlaştırılması ve katılım sağlanması konusunda destekleri önemlidir. Taksim Dayanışması; yaptığı açıklamalar, yayımladığı bilimsel raporlar, topladığı onbinlerce imza ve kazandığı davalarla Gezi parkının çivi çakılamaz bir kent mirası olduğunu ispatlamış, Haziran direnişi ile milyonlarca yurttaş bu durumu tescil etmişti. Dünyada örneği az görülebilir bir biçimde ülkenin 80 ilinde milyonlarca yurttaş bu tartışmaya aktif müdahil olmuş, Gezi’de simgeleşen talepler üzerinden şehirlerinin caddelerini ve parklarını aylar boyunca demokrasi şölenine dönüştürmüştü. Bu nedenle, hala Gezi parkı üzerinden provokasyon yapmak isteyenlere karşı, mimarinin ve şehir planlamacılığının bilimsel gerçeklerini benimseyen, hukukun defalarca verdiği kararları ve yaşanabilir kent talebini dikkate alan, bu ülkenin geleceğini, toplumsal barışını dert edinen, aklını ve izanını kaybetmemiş yurttaşlarına seslenmek istiyoruz! Tarihin ileriye doğru yürüyüşünü durdurabileceğini düşünenlere, suyun tersine akacağına inananlara, rant ve siyasal ikbal uğruna gerilimden, çatışmadan medet umanlara karşı uyanık olalım. Kavganın, ölümlerin, hakaretin, öfkenin olağan, makbul bir siyaset yapma yöntemi ve seçim yatırımı haline getirilmesine, Gezi parkının bu ülke yurttaşlarının kutuplaştırılacağı yeni bir araca dönüştürülmesine izin vermeyelim. Haziran direnişi Gazi Parkında simgeleşen değerlerle ve tarihin ona yüklediği sorumlulukla üzerine düşeni yaptı. Bu ülkede, yaşamına müdahaleye, demokratik değerlerine saldırıya, kadınların aşağılanmasına, LGBTI bireylerin yok sayılmasına, dayanışma, paylaşım ve direnişle yanıt verdi. Rantın-talanın karşısına dikilecek milyonlar olduğunu ve bu mücadelenin tarihsel olarak haklı ve onurlu olduğunu herkese gösterdi. Bu tarihsel gerçeklik, TOMA’larıyla, özel timleriyle gençlerin kurşunlanmasına niyetlenen bir kötülüğün “iş makinalarını ve çimento kamyonlarını” parka sokmasıyla değiştirilemez. Yani o iş bitti. Gezi Parkı tarihsel misyonunu tamamladı. Koca bir yaşama sahip çıkabilmek için öncelikle üç beş ağaca sahip çıkmak gerektiğini; kent yağmasına izin vermemenin özel yaşama müdahale edilmesine ses çıkarmakla eş anlamlı olduğunu; dereleri, çayları HES, her yeri maden ve taş ocağı; şehirleri beton yığınağı haline getirmeye çalışan rant siyasetine karşı çıkmanın yaşamsal olduğunu herkese göstermekle kalmadı, herkesle birlikte bunlara karşı direnmenin coşkusunu da yaşattı. Artık herkes biliyor. Kimisi farklı kaygılarla sessiz kalıp görmezden gelse de Gezi’de sahip çıkılan değerlerin karşısında insanlıkla örtüşmeyen bir anlayış çaresizlikle çırpınıyor. Sorunu ve soruyu çok basite indirgesek, milyonlarca insana Park mı Rant mı? diye sorsak hangi siyasi görüşe sahip olursa olsun farklı yanıt vereceğini mi sanıyorsunuz? Bu ve benzeri soruları sordu Gezi süreci herkese ve alınan yanıt Gezi’nin tarihsel gücünü tescilledi. Bu nedenle Gezi’ye gelmemiş hatta siyasal kutuplaşmada, sandıkta Gezi’ye saldıranların safında yer almış ülkedeki milyonlarca yurttaşın bilincinde dahi Gezi’nin insanlık adına taşıdığı pozitif imajın ve kendisi için değil toplum için mücadele edenlere saygının izdüşümü var. Buradan herkese bir kez daha açıklıkla ifade ediyoruz. Gezi Parkında simgeleşen mücadele ile baş edebilmeniz için planladığınızdan çok daha fazla “iş makinası ve çimento kamyonuna” ihtiyacınız olacak. Bu ülkede kaç lise, kaç üniversite varsa, deresine sahip çıkan kaç köy, bedenime karışma diyen kaç kadın, dilimi, kimliğimi, varlığımı inkar etme diyen kaç kürt varsa, inancımı sorgulama diyen kaç alevi, acımı reddetme diyen kaç ermeni, yönelimimi kabul et diyen kaç LGBTI birey varsa, o kadar Gezi Parkı çıkacak karşınıza. Bazen İstanbul’da bazen Diyarbakır’da bazen Artvin Cerattepe’de göreceksiniz Gezi’yi. Her yerdeyiz diyenlerin sözüne sadık kaldıklarını yaşayarak öğreneceksiniz. Liselerde sırtını döneni de olacak, üniversiteleri talancılara dar edenleri de. Bazen bir şarkının son nakaratı bazen bir filmin ilk sahnesinde karşılaşacaksınız. Gelmeyen turist için öfkelenen esnafın dükkan önünün Gezi Parkına ne kadar benzediğine şaşacaksınız. Ürününün karşılığını alamayan köylünün de kiralık işçi olarak köleliğe mahkum ettiğiniz işçinin de Gezi parkına uğramış olduğunun farkına varacaksınız. Kadınları söylemeye gerek yok. Her an Gezi parkında dönüyormuş gibi yaşadıklarını ve davrandıklarını herkes gibi zaten biliyorsunuz. Çünkü Gezi Parkı Topçu Kışlası görünümlü rezidans ve alışveriş merkezi haline getirmek isteyenlerin iştahını kabartacak bir “kupon arazi” olmaktan çoktan çıktı. Hatta Gezi Park olarak bile tanımlanamaz artık. Binlerce beton bina ile kuşatılmış Taksim meydanı etrafındaki tek yeşil alan, gölgesinde oturabilecek ağaç barındıran tek park olduğu doğru. Ama daha büyük bir hakikati var artık o parkın. İnsanım diyenlerin görebilecekleri suretler, duyabilecekleri ağıtlar arasında, ondördünde, yirmi birinde toprağa düşmüş, oradaki ağaçlara cansuyu olmuş gençlerin anıtları duruyor o parkta. Hiç görmediği bir parktan yükselen özgürlük talebine ortak olmak için Eskişehir’in dar ve karanlık sokaklarında eli sopalı çakalların saldırısında canını veren Ali İsmail’den daha cesur olabilir ki? Kızılay meydanında kendisine doğrultulmuş silaha karşı bedenini siper eden Ethem’den, Geziye yürüyenlere yol açmak için otobana fırlayan Mehmet’ten, mafya bozuntularına direnen Hasan Ferit’ten, Jandarma kurşununa siper olan Medeni’den daha cesur olabilir? Antakya sokaklarında geceyi sabaha çeviren Abdocan ve Ahmet’ten ve daha ondördünde Okmeydanı’ndaki ekmekle Gezi parkının güllerini bedeninde buluşturan Berkin’den daha cesur olanını tanıyanınız var mı? Tam 3 yıl oldu… Taksim Meydanı ve Gezi Parkı başta olmak üzere, yaşam alanlarımıza amansız ve hukuksuz bir şiddetle saldıranların karşısında omuz omuza verdik. Gençlerimizin yaratıcı zekasıyla, annelerimizin kucaklayan şefkatiyle, işçi kardeşlerimizin emekten gelen gücüyle, kadınlarımızın gür sesiyle, LGBTİ bireylerimizin biz de varız çığlığıyla el ele verip dayanışmamızı ve direnişimizi büyüttük. Bu onurlu direniş ve evrensel dayanışma karşısında çaresizlerin ve korkakların günden güne daha da kirlenen politikalarına, , günden güne tırmandırılan şiddetine, adaletsizliğine karşı biz Gezi’nin çapulcuları onlarca ayrı dille, sesle, renkle bir arada durduk, nefes aldık. Gezi bu ülkenin imdat çığlığı, direnme refleksi, derin bir nefes alışıdır! Haksızlığa, adaletsizliğe, keyfiliğe, dayatmaya, baskıya karşı direnmenin adı, bir parktan tüm ülkeye ve dünyaya yankılanan kente, doğaya, yaşama sahip çıkanların hep bir ağızdan, bir arada söyledikleri şarkıdır. Emekten yana, yoksuldan yana, doğadan yana, ezilmişten yana, ötekileştirilenden yana, kadından yana, Barış’tan yana her direnişin içinde yer alacağı, direnen herkesin dilinden düşürmeyeceği bir şarkı. Suruç’ta, Diyarbakır’da, Ankara’da, İstanbul’da, Bursa’da patlayan bombaların, yaşatılan katliamların, komşularımızla yaratılan savaş ikliminin, iş cinayetlerinin, kiralık işçiliğin, taciz ve tecavüz ortamının, kadın cinayetlerinin, ihalelerin, rüşvetlerin, komisyonların, rantın, HES’lerin, orman katliamlarının, siyasal islam dayatmalarının, diktatörlük yöneliminin yarattığı kakafonik ortama rağmen, berrak ve duru bir sesle direnişin ve umudun şarkısı her yerden duyulmaya devam edecek. Bilinir ki, sesler ve şarkılar kaybolmaz, uzayda sonsuza kadar salınırlar. Gezinin de direnişin olduğu her yerde umudu diri tutanların dillerinden düşmeyeceğini artık herkes biliyor. 31 Mayıs 2013 günü ve sonrasında; Yani GEZİ’den ve Haziran direnişinden bu yana, Bu ülkede kimilerince yüzbinler, kimilerince milyonlar önce sokakları ardından parkları doldurdu. Kimseden emir almadan, hiçbir beklentisi olmadan, kendisi için değil bu ülkenin ruhunu, kadınların, gençlerin geleceğini korumak adına kendini siper eden gençler ülke tarihine silinmeyecek bir miras bırakarak can verdi. Mehmet Ayvalıtaş, Ethem Sarısülük, Abdullah Cömert, Ali İsmail Korkmaz, Hasan Ferit Gedik, Medeni Yıldırım, Ahmet Atakan ve Berkin Elvan nasıl ki, bizlerden ayrıldıkları yaşta kalacak ve nasıl ki onları hep o gülen yüzleri ve kararlı direnişleri ile hatırlayacaksak; işte Gezi de bu gençler gibi yaşlanmayacak. Paraya, pula, iktidar hırsına, her türden erke, yağmaya, talana, hırsızlığa, adaletsizliğe isyan edenlerin ve her daim barış isteyenlerin aklında ve en coşkulu, en kararlı insanların ruhunda Gezi’nin bu yaşlanmayan direngen yüzleri yaşamaya devam edecek. 3 yıl oldu, hala buradayız, bir aradayız! Barış’tan korkanlara inat bir aradayız, buradayız! Suruç’tan Sultanahmet’e, Sur’dan Bataclan’a, Cizre’den Ankara’ya, bir aradayız! Dört Ayaklı Minare’den Beyrut’a, Paris’ten Beyoğlu’na bir aradayız! Cerattepe’de, Aliağa’da Akkuyu’da, Çukurova’da bir aradayız. Soma’da, Kilimli’de Ermenek’te bir aradayız. Taksim’deyiz! Gezi’deyiz! Buradayız! 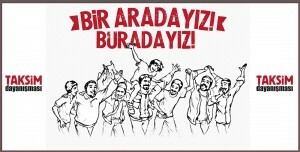 Bir aradayız! Taksim Dayanışması olarak 31 Mayıs 2013’ten bu güne yaşadığımız süreci değerlendirmek, gelişmeleri paylaşmak ve Direnişimizin üçüncü yılında etkinlik programını açıklamak üzere 27 Mayıs 2016 Cuma günü saat 11.00’da TMMOB Mimarlar Odası İstanbul Şubesi Karaköy Binası’nda gerçekleştireceğimiz basın toplantısına tüm basın mensuplarını ve duyarlı halkımızı davet ediyoruz.